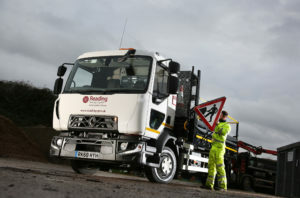 Renault Trucks is to supply Reading Borough Council with 7 Range D12 tippers, a D16 tipper grab, D18 tipper and C2300 18t gulley sucker truck to replace some of its fleet of 240 vehicles. The Range Ds will carry tarmac for road surfacing work including drop kerbs and fixing potholes across the borough. The trucks have a ‘key out system’ which allows the truck and tools to keep running even when the key has been removed. They also feature low down windows for improved side visibility. “Reading Borough Council is committed to doing everything it can to look after the safety of other road users and the Range D’s Vision Door is a vital feature, especially in the busy urban environments where these vehicles operate,” said Reading Borough Council fleet and transport assistant manager Tom Howes.